MyFreedomSmokes just kicked off their newest Weekly Sale. Once again, they’re offering a 20% discount on all Cotton, Wire, Wicks, and Mesh. Just be sure to apply coupon code “WIRE20” at checkout to get the reduced prices. There are some nice deals up for grabs here too. Examples: $3.16 Wotofo Organic Agleted Cotton Strips (30 pack), $7.96 OFRF nexMESH (10 pack), $2.79 Wotofo Mesh Strips (10 pack), $3.96 Geekvape Fused Clapton Coils 2-IN-1 Kit. If you’re running low on supplies, this might be a good opportunity to stock up on a few things. Just keep in mind that this sale officially ends Monday (2/18) at 11:55pm EST. And don’t forget to check out their Deal of the Week while you’re there too (link below). 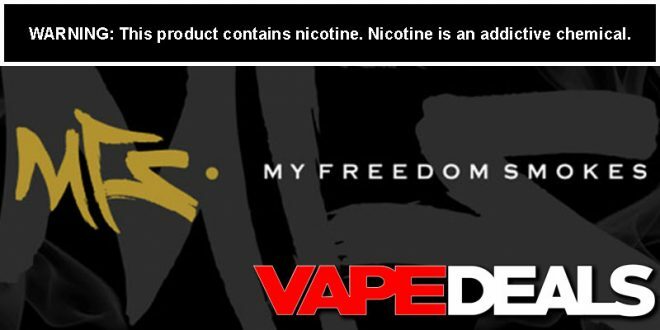 MyFreedomSmokes offers free shipping on orders over $75 (or free shipping on EVERY order if you have an AMPD account).